Ashley Horton Designs: Workin' On My Off-Week!! Today kicks off the newest Fabulous Friday challenge at Frosted Designs and technically, it's not my week to Post, but I HAD to participate in this week's challenge!! It is right up my alley, and I am sure you want to know what it is!! We are challenging you to use ONLY Patterned Paper on your layouts or projects. Now, don't let that scare you...it's a lot easier than it sounds. I would say that I use all patterned paper on about 80% of my layouts. Sometimes I throw in a solid background, but it is rare. Or I will use cardstock to create a die cut title. But, I am here today to share my very easy secret for using all patterned paper...choose a coordinating line/collection of paper. Most manufacturers include lighter more subtle patterns in their packs, along with brighter and bolder patterns. Normally, I like taking out the less busy patterns to use as a full background or the larger part of paper, that I need for my page. Then, I start building in the other patterns and colors. For those who are just starting out with using all patterned paper, here's an easy recipe: Use the more subtle patterns in larger doses and the busier patterns in small doses. You can also put together your own papers for your layout, by using this same recipe, if you don't have any coordinated collections or lines laying around. Echo Park is a great company, and they put their lines together very well. I decided to re-visit my Note to Self collection for this challenge and I also added in a couple of sheets from Kaisercraft's Technologic line. And yes, I did use a darker background on my page, but it still has a subtle pattern. The red pattern and graph paper have enough contrast to stand out from the gray, so it totally worked. Even some of my embellishments are cut from patterned paper!! :) The robots are from the Kaisercraft line and the view master reels (which are my favorite, btw), come from one of the sheets of the EP paper. "When Daddy and Mommy were little, we didn't have hand-held video games or cell phones with Angry Birds and YouTube. But times have changed and I must admit that portable entertainment comes in handy when you have 3 rowdy kids!!" I wanted to share one more thing in this Post. Next week, Creating Keepsakes will be holding their Annual CK Summer Camp. This is always so much fun and I hope you will come over and check it out. If you visit CK's Blog, you will find a preview of what will be going on each day (make sure you scroll to the end of the post, for the preview). Beginning Monday, July 23, head over to Club CK and check out the Club Blog, to see what will be going on that day. This is great love the misting! great LO... the darker background worked well with the reds and whites. Love how you did the misting. hehehehehe... I am a PP only gal!! lol!!! I hardly own any cardstock! :) I love love love love your lo!!! Soooooooooooo fun!! LOVING the buttons in the middle of the view finders!!!!! 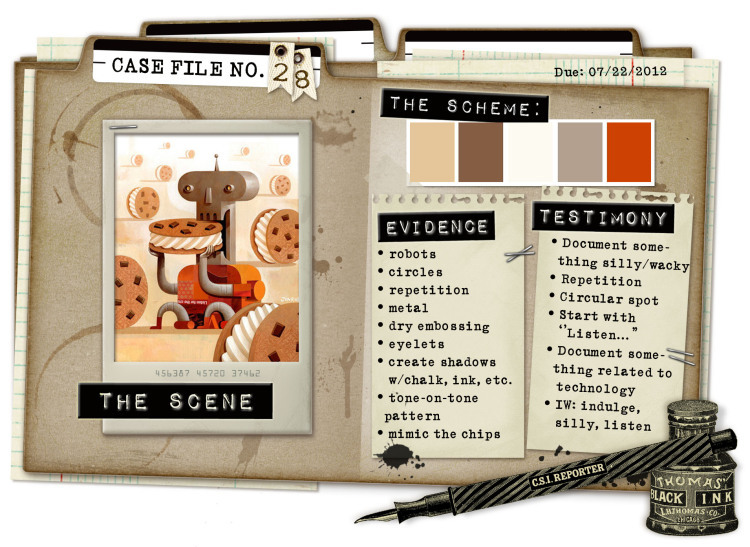 A very cute layout, love the colors and fun elements....the buttons inside the viewfinder, neat! Thanks for the inspiration! Wow Ashley, what a cool layout ! 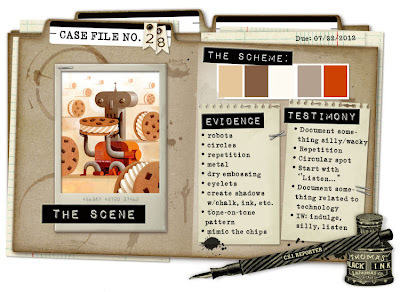 It's so funny because I have a few papers from the Note to Self collection and when I saw this week's case with CSI, I thought immediately about this collection too ! I really love how you present this new technology era on your layout - it's great inspiration ! thanks ! this one is great -- I love how you used the studio calico chevron mask-- i wouldn't have thought to do it off the page like that -- love it! I don't know how you always come up with the perfect embellies! great job! Great LO! I never really noticed that you used all PP on most of your LOs before. Neat! Great use of the Echo park paper...and the view master paper. I love it.